Target mailing for first time buyers. 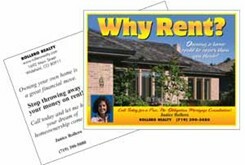 Target this eye popping post card to apartment dwellers and renters. Many will be surprised to learn that home ownership is not beyond their means. Help them realize the American Dream. Full color front, black and white back, 4.25"" x 5.5"", Quantities under 1,000 will be printed on 12pt Kromekote (gloss on color side), 1,000 + on 14 pt uv coated (on color side) Customize It - Once you've placed your order, you'll upload or email your photo, logo, contact info and any designations you'd like to include. We'll send you a proof, normally within one business day. We don't print it until you say it's ready.